Survey Results: How Reasonable are Appraisal Turn Times? As of this writing, 2,455 appraisers have participated in the OREP/Working RE How Reasonable are Appraisal Turn Times? Survey. Find the data below. Appraisers report that turn times are unreasonable much of the time. Further, turn time demands do not vary much according to complexity. However, ordering entities do allow more time when it is requested. Most appraisers indicate they are penalized for not making required turn times, at least some of the time. Finally, appraisers say they are not letting unreasonable turn time pressure hurt the quality of their reports- most of the time. 72% of appraisers say that requested turn times are “reasonable” half of the time or less. 75.8% of appraisers say turn times vary depending on the complexity of the property half of the time or less. 71.9% of appraisers say the ordering entity allows more time when required half of the time or more. 48.4% of appraisers say they are penalized, fee or otherwise, for not meeting required turn times half of the time or more. 26.3% of appraisers say they deliver reports of diminished quality to meet unreasonable turn time demands half of the time or more. 1. Requested appraisal turn times are “reasonable” about what percentage of the time? 2. Requested appraisal turn times vary depending on the complexity of the property about what percentage of the time? 3. The ordering entity allows more time when you indicate it is required about what percentage of the time? 4. You are penalized, fee or otherwise, if you are unable to meet the required turn times about what percentage of the time? 5. You deliver reports of diminished quality to meet unreasonable turn time demands about what percentage of the time? Tom Smith (name changed for privacy concerns), is an appraiser in a rural area who insists that the typical demand by AMCs for three-day turn times do not allow for the necessary due diligence and analysis required for a quality appraisal. “For the rural properties in this area, three days is not a reasonable amount of time to do an adequate job. 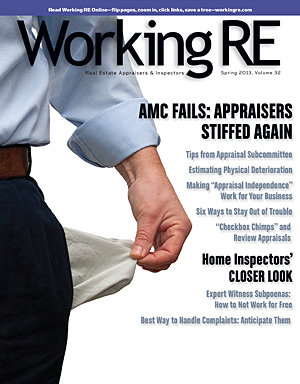 The AMCs that are ordering appraisals are ordering based on the quickest turn times and the lowest fees and the result is that honest, ethical appraisers who are doing good work are being pushed out of business,” says Smith. Smith, 57, says that he usually needs five business days to complete an appraisal after the date of inspection. “That probably sounds like a lot of time for other appraisers, but this is not a metropolitan area, this is a rural area. In a rural market, we have no tract homes, everything is individually built. To find enough sales, an appraisal report usually takes five comps, instead of the standard three that the form is designed for and that most metro appraisers use,” says Smith. According to Smith, to complete a quality appraisal in his area requires an appraiser to access two MLS systems, as well as two local databases that contain sales that are not listed in the MLS system. Smith stresses that each sale has to be carefully reviewed and analyzed, and that a single MLS system fails to capture all the relevant sales, so an appraiser has to exercise due diligence and must research all pertinent sales, and then use proper judgment to make the appropriate adjustments. The result of the push for faster turn times and lower fees is that Smith says he is being driven out of business. “I’ve been appraising for nearly 30 years, but for the past year I’ve been looking for another job because I can no longer make a living doing appraisal work. Because the guys with the lowest fees and the fastest turn times are getting all the work. Some of the appraisers have been improperly trained and don’t know better, some do know better, but don’t follow the rules. Some appraisers do not understand USPAP, and some appraisers do understand it but choose to ignore it. According to Smith, what lenders and AMCs don’t recognize is that a quality report takes time.